Old Goa was the state's capital city until 1843, when it was moved down river to Panaji. Once a byword for splendour, with a population of several hundred thousand, Old Goa was virtually abandoned from the 17th century, as the river silted up and a series of malaria and cholera epidemics drove out the inhabitants. It takes some imagination to picture the once-great capital as it used to be. The maze of twisting streets, piazzas and grand Portuguese villas have long gone: all that remains are a score of extraordinarily grandiose churches and convents. Old Goa has been declared a UNESCO World Heritage Site, and today is the state's main cultural attraction. Tourists take a break from the beach resorts to come and admire the massive facades and beautiful interiors of the city's well-preserved churches. The Tuscan St Catherine's Cathedral is the largest church in India and took eighty years to build, finally being consecrated in 1640. The scale and detail of the Corinthian-style interior is overwhelming: huge pillars divide the central nave from the side aisles, and no less than fifteen altars are arranged around the walls. An altar to St Anne treasures the relics of the Blessed Martyrs of Cuncolim, whose failed mission to convert the Moghul emperor Akbar culminated in their murder; while a chapel behind a highly detailed screen holds the Miraculous Cross, which stood in a Goan village until a vision of Christ appeared on it. Reported to heal the sick, it is now kept in a box; a small opening on the side allows devotees to touch it. Other sights worth seeing include the Arch of the Viceroys, built in 1597 to commemorate Vasco da Gama's arrival in India, and the distinctive, domed Church of St Cajetan (1651), modelled on St Peter's in Rome. 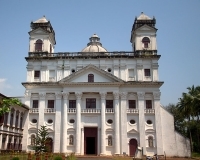 Old Goa is a major site for Christian pilgrims from all over India who come to visit the tomb of St Francis Xavier, the renowned 16th-century missionary whose remains are enshrined in the Basilica of Bom Jesus.